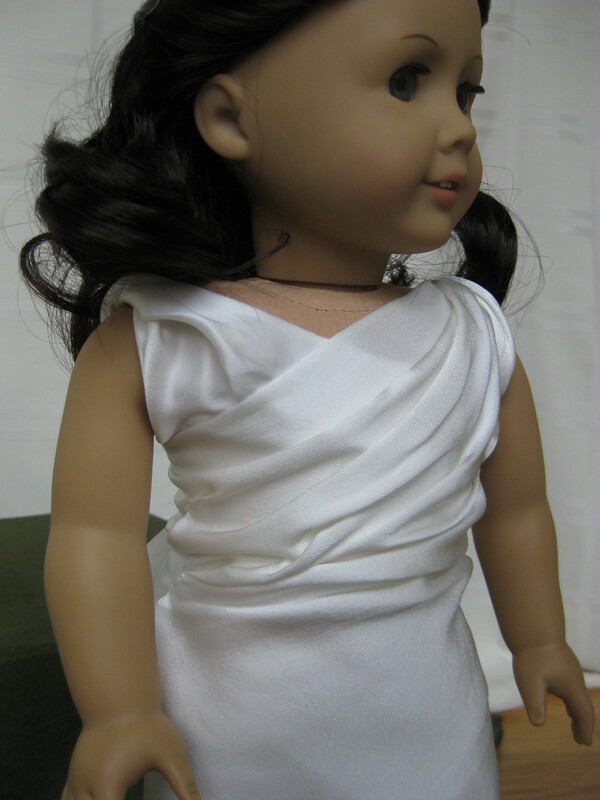 Recently, we were playing around with some fabric trying to make a dress via draping — arranging the fabric directly into a dress shape, rather than first making a flat pattern. After some twisting, pinning, cutting, and resewing, we’d made a dress! The underbodice was simple enough, content to twist around one arm and be done. 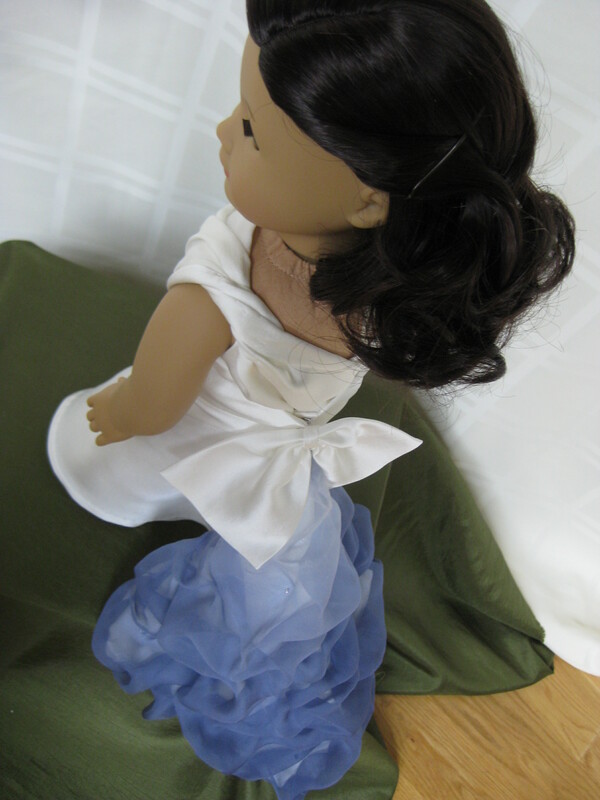 The main dress, however, twisted over the other arm and cascaded down the back in a large, square train. 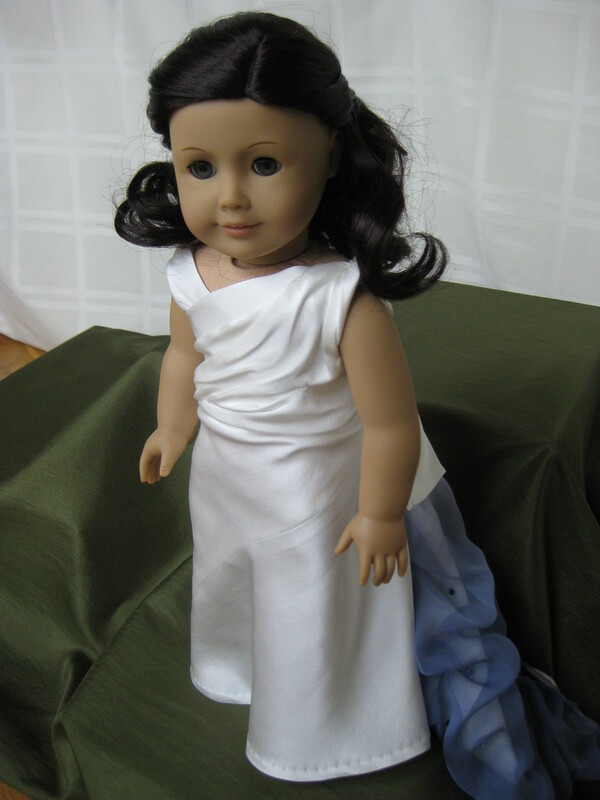 We loved the way this dress evoked both 1930’s movie star glamour and ancient Greece! Of course, we still had to find a suitable fabric to make it up in. When we went shopping, we settled upon a buttery-soft silk charmeuse, with just enough color to make it slightly off-white. 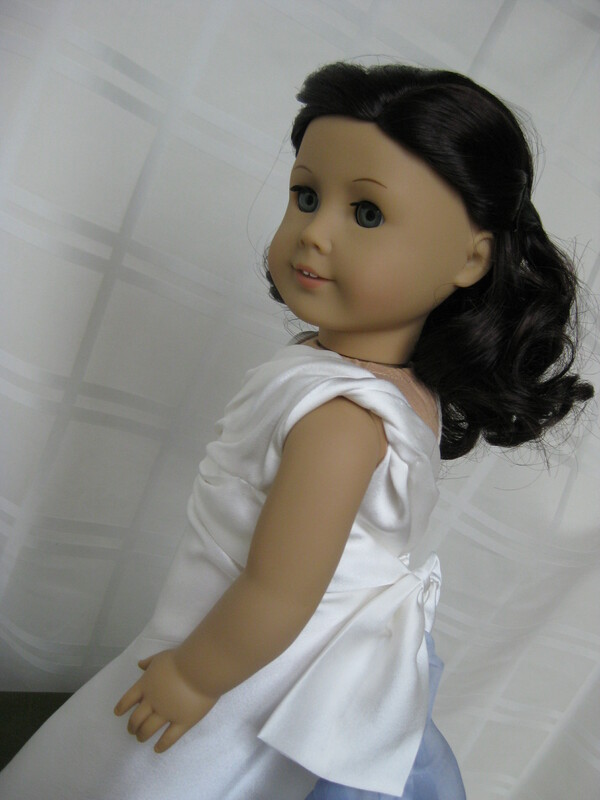 We loved how much drama using white was going to give this dress! However, there was still the question of the train. Clearly, there was plenty of room for creativity; the question was, how to decorate such a lovely blank canvas? 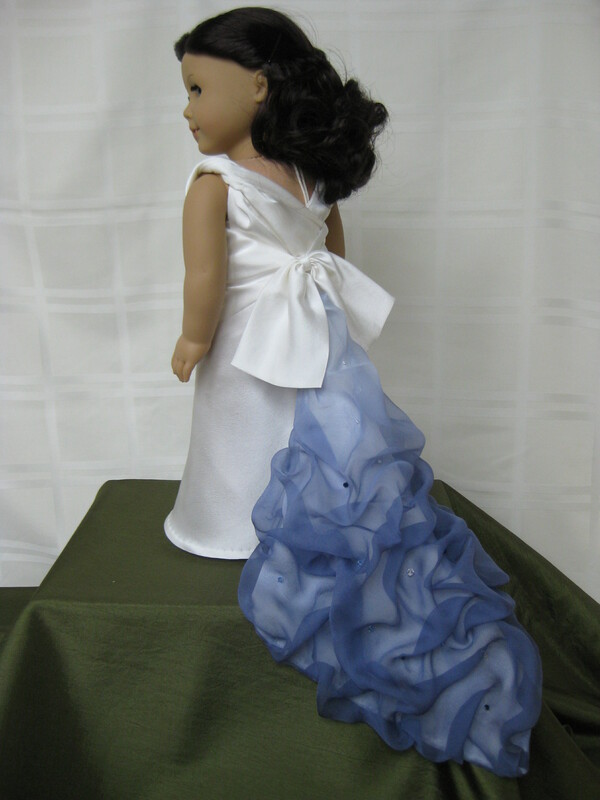 Melody remembered an article she’d read a while back about using silk organza to create a poufed, bubble-like overlayer. 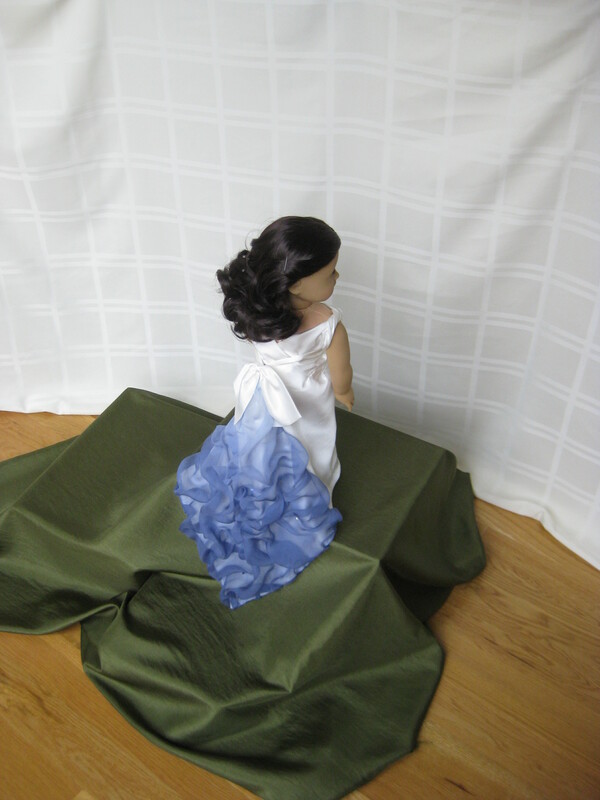 We had some silk chiffon (which is much softer) hanging around, and I decided to use that to create the same effect. 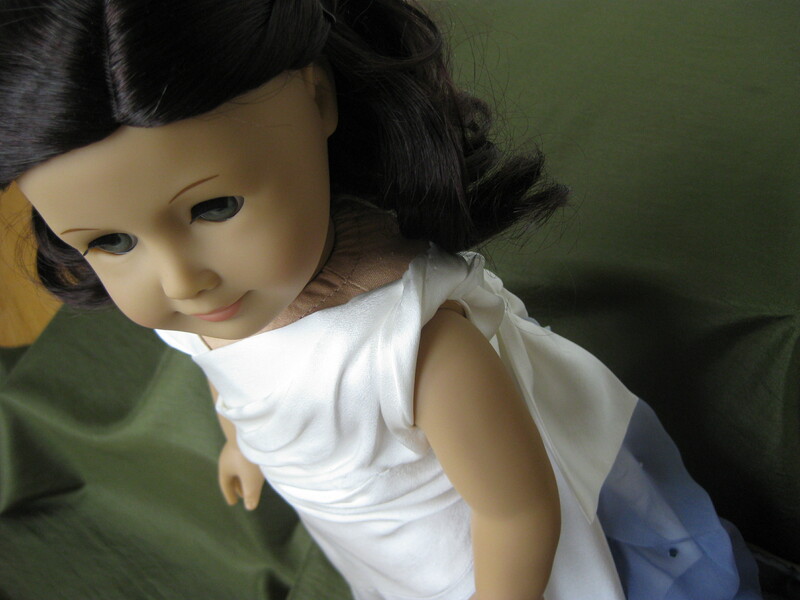 Because dolls are much smaller than people, a softer fabric is often more appropriate than a stiffer one, so I was confident it would work. 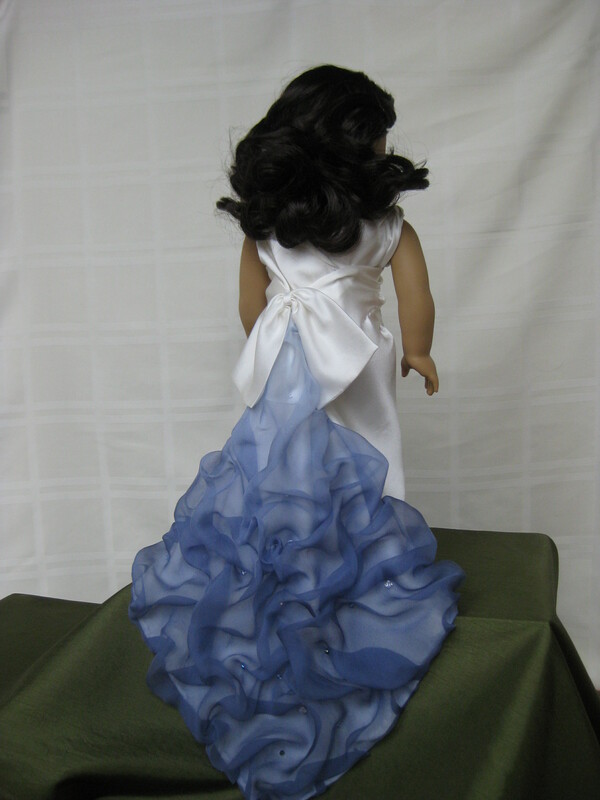 Then, to take the drama up a notch, we decided to hand-dye the chiffon overlayer. I got creative with the dyebath and carefully gradated the color, leaving the chiffon lighter at the top and striving for a darker, more intense shade at the bottom. When we tacked the chiffon overlayer in place with Swarovski crystals, the effect was exactly what we’d hoped for — drama, luxury, and elegance with a vintage twist! The colors flow together beautifully! I love the train; it really makes the dress unique and elegant. 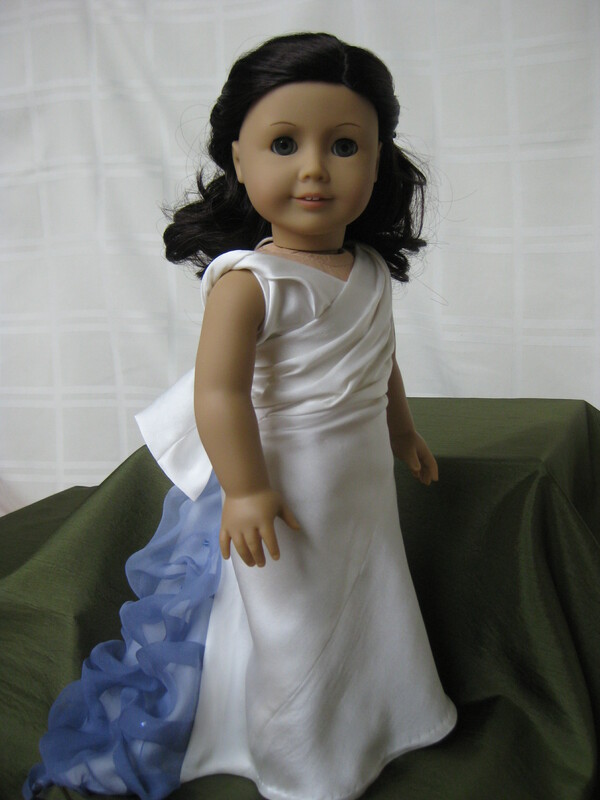 Lets say you wanted a custom dress like this but in different colors? If you’re interested in a dress similar to this one, please drop us an email at melodyvalerie (at) live.com, or ‘convo’ us on Etsy, and we can discuss it from there! I love the blue in the back . Its the same as my sisters prom dress.